This was the first book I’ve read in the Our Canadian Girl series and I was very impressed! It was delightfully written with very down-to-earth and realistically portrayed characters. The series all deal with different girls and their experiences during important Canadian events throughout history. This particular novel is Book 2 in the Marie-Claire subseries. 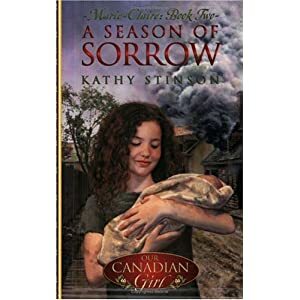 A Season of Sorrow deals with some pretty serious subject matters based on real-life events in Canadian history. This particular novel was set during the time of the Smallpox epidemic in Montreal during the late 1800’s. As I mentioned, it deals with some pretty sombre subject matter including the gruesome smallpox illness, death of family members, separation of family members during wartime, adult depression as well as the hazards during the time such as fires that would consume whole neighbourhoods. I would imagine it could be fairly upsetting to the more sensitive readers and having an adult to debrief with after reading the story might be a good idea. While it is not a Christian fiction book, it does mention religion as it played a huge part in the lives of the people in the late 1800’s. Especially in French Catholic neighbourhoods. I was pleased that it did not overtly criticize religion or down play it at all in this novel. I felt it was a fairly accurate representation of people struggling with their faith during times of great loss. I was really impressed by this novel and will be keeping my eye out for more in this series for sure!